The cold, dark waters more than a hundred metres below the surface of the ocean are not a forgiving environment for human beings. The pressure, more than 10 times that at the surface, can quickly cause unconsciousness – fatal at that depth. But for freedivers – a small band of extreme sportsmen and women who propel themselves down in no more than a wetsuit – the deepest part of the dive is not even the most dangerous. That comes as they ascend to the surface, sustained by a breath taken several minutes before, when a diver can succumb to so-called “shallow water blackout” just metres from fresh air. 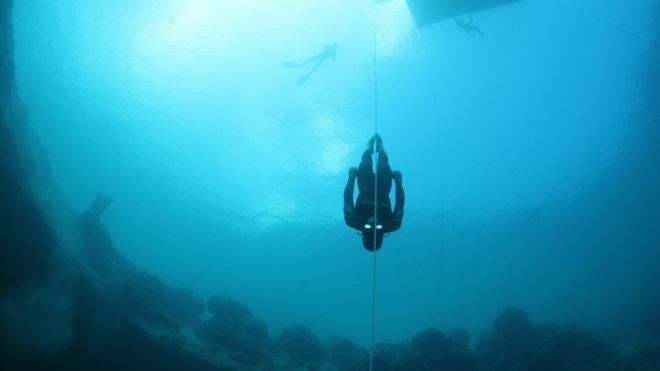 Natalia Molchanova, widely regarded as the best female freediver in the world, took a deep breath on Sunday and dipped beneath the waves off the coast of Ibiza. She had done this countless times, but this time she didn’t resurface. On Tuesday, the International Freediving Association (AIDA) released a statement saying Ms Molchanova was missing, and she is now presumed dead. Ms Molchanova was not performing a deep dive. If anything, Sunday’s dive was completely routine. According to the AIDA statement, she was at just 30m-40m – well short of her record depth of 127m. She was however performing a kind of dive called Constant Weight Apnea Without Fins (CNF) in which the diver wears just a weight belt and thin wetsuit. It is thought that she was caught in a strong underwater current and, without any fins to help propel her, was unable to fight against it. The search for her body continues.